Savile Row was built between 1731 and 1735 as part of the development of the Burlington Estate and is named after Lady Dorothy Savile, wife of the 3rd Earl of Burlington. Initially, the street was occupied by military officers and their wives; William Pitt the Younger was an early resident. Irish-born playwright and MP, Richard Brinsley Sheridan lived at 14 Savile Row for a short time before his death in 1816. During the 1800s, the gentry became concerned with neat dress, and Beau Brummell epitomised the well-dressed man. He patronised the tailors congregated on the Burlington Estate, notably around Cork Street, and by 1803 some were occupying premises on Savile Row. None of those original tailors are there today. 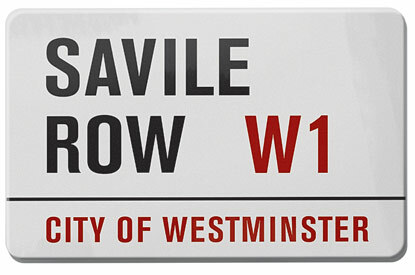 In 1846, Henry Poole is credited as being the ‘Founder of Savile Row’ after opening a second entrance to his late father’s tailoring premises at № 32 Savile Row; however, there were tailors on the Row long before Poole’s. A modernisation of the Row has occurred ever since, continuing in the 1990s with the arrival of designers like Ozwald Boateng and Richard James. The Row is a mecca for men around the world who want the very best in cloth and tailoring, and continues to attract those seeking the best in British elegance and craftsmanship. Every house has a ‘house style’ which is unique to itself. Decide whether you want a suit that is either heavily structured (somewhat military), or soft and natural. That will help you be clear in your mind before discussing the options with tailors. There’s a great deal of choice out there so its worth being clear in our mind before everyone starts telling you why they are the best. What do I like? Well that’s easy. For being classic, for being soft and natural and for being cut with such great shape.